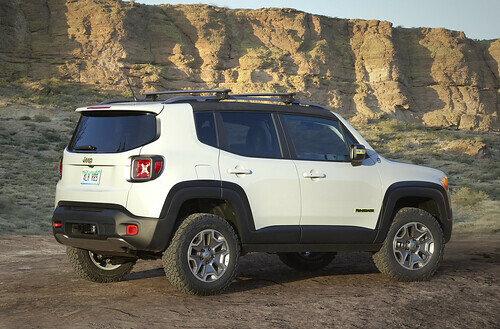 The Jeep Renegade Commander concept vehicle is equipped with an assortment of Mopar and Jeep Performance Parts to tackle the ultimate off-road adventure. A 2-inch lift kit and 17-inch Rubicon aluminum wheels with 29.5-inch BF-Goodrich All-Terrain T/A KO2 tires increase the off-road capabilities of the Jeep Renegade Commander. The “Fluorescent Gray” exterior features Renegade’s MySky open-air roof with removable panels, custom body decal, Mopar off-road rock rails, skid plates and a modified exhaust.